It's the most wonderful time of the year … Strawberry Season! We've got some great strawberry specials that you're sure to love. Read on to see what's new! First up is our famous Strawberry Pie – we've been making them since 1954! Boasting two whole pounds of strawberries in every pie, it's on sale this month for $9.99. Love strawberries but prefer your pie a bit creamier? Try our Strawberry Crème Pie! It's the best of both worlds! Strawberries are great for breakfast, too! 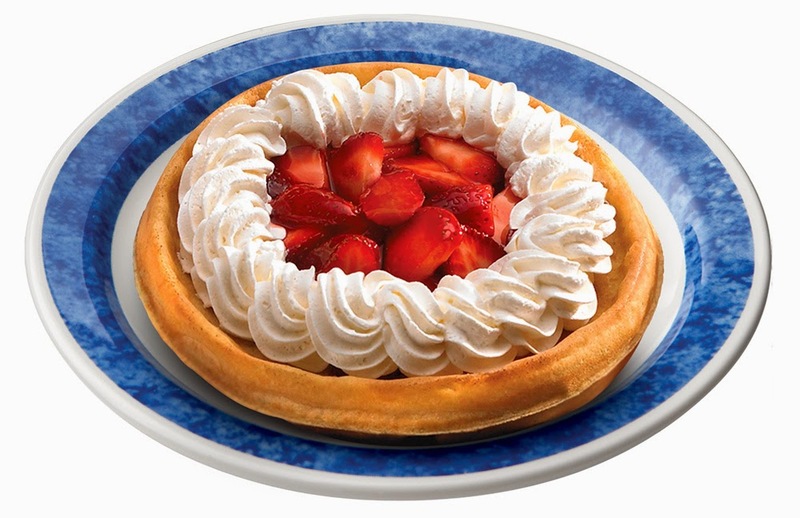 Our classic Strawberry Belgian Waffle is topped with freshly sliced strawberries and whipped topping. It’s less than 400 calories and is just $5.99. Thinking salad? Our Chicken and Strawberry Salad is back! Grilled julienne slice of tender chicken breast served on a bed of mixed greens and crisp spinach, topped with sliced fresh strawberries, sliced almonds and our warm poppy and sesame seed dressing. It also comes with our fresh-baked strawberry bread. Delicious! Just $7.99. It's even better when you add bleu cheese crumbles for 50¢! And last but certainly not least – Strawberry beverages! We’re featuring Strawberry Lemonade and our famous Strawberry Milkshake. Simply sweet and berry delicious!